These cookies. Oh my goodness, it’s been a long time since I’ve eaten anything this delicious! I haven’t done much baking in the past few months since moving to Bastyr. First, I’ve been very busy with my full school load, and I focus my cooking energy on the necessary things (meals, not cookies). Second, if I make a batch of cookies, then I’ll eat it. So there is that. But over Christmas break, I had time to crack out my coconut flour and do some baking. These Paleo Shortbread Cookies not only melt in your mouth, but they are extremely simple and fast to prepare. These shortbread cookies pair beautifully with a cup of tea or spread with jam. I also like to crumble them over baked pears for a delicious crunchy topping. Coconut flour – My favorite grain free flour, coconut flour provides the base for the recipe. The process of baking the cookies seems to bring out a toasted coconut flavor, which I adore. Coconut flour is available here or at health food stores. Arrowroot flour – Another one of my favorite grain free flours, arrowroot flour lends a melt-in-your-mouth factor to this shortbread. Arrowroot flour is available here or at health food stores. Coconut sugar – Coconut sugar is a mineral-rich, unrefined sweetener made from dehydrated coconut sap. It is lower glycemic than many other sweeteners and has a faint maple flavor that works beautifully in this recipe. 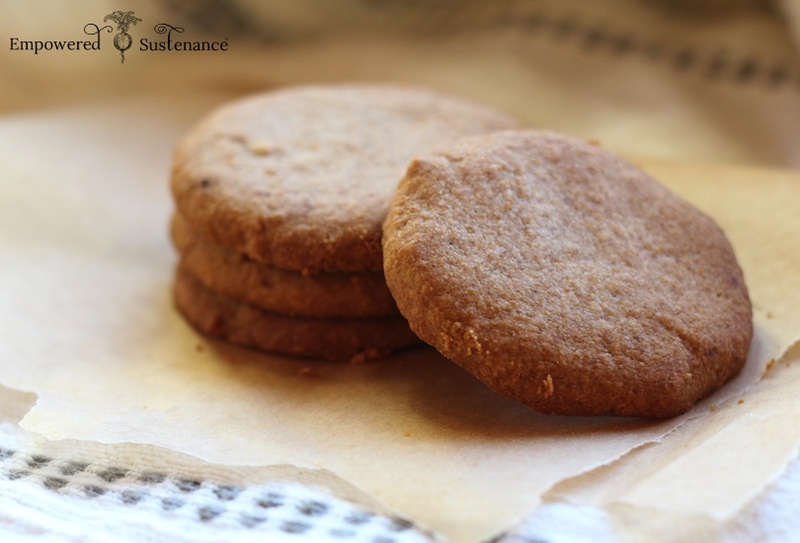 Processing it in a blender for this recipe creates a superfine sugar that allows these cookies to melt in your mouth. Coconut sugar is available here or at health food stores. These shortbread cookies simply melt in your mouth and pair beautifully with a cuppa tea. It's important to let the cookies cool completely before removing from the baking sheet, since they will crumble while warm. First, make the superfine coconut sugar by blending the coconut sugar in a high-powered blender. See the note below for instructions. This ensures that the coconut sugar is not crunchy or gritty in the finished cookies. To properly measure the coconut flour for this recipe, don't pack the flour into the measuring cup. Stir the flour with a fork, dip the measuring cup into the flour, then level the top. Melt the coconut oil in a saucepan over low heat. Remove from heat and stir in the remaining ingredients. Use a tablespoon measure to drop the cookie dough onto the baking sheet, making slightly flattened balls (the cookie dough will not be very stiff). Bake for 6-8 minutes, until just golden. The key is watching the cookies carefully during the brief baking period, because they brown very quickly. Remove the tray from the oven and let cook for at least 15 minutes before removing from the baking sheet, or they will crumble. The cookies will be very delicate at room temperature. For a crunchier and sturdier cookie, place in the freezer for at least 5 hours and enjoy from the freezer. Store the cookies in the freezer. To make superfine coconut sugar, place ¾ - 1 cup of coconut sugar into a high powered blender. A Vitamix or Blentec works well, but I love using my Ninja Blender. Blend on high speed for about 2-3 minutes, until the sugar is finely ground and a bit powdery. It will not be as fine as powdered sugar, however. You can use the leftover sugar for sweetening beverages or desserts. I hope you enjoy the recipe! Eat well and heal™! Tis a great company called Azure Standard. It is located in Oregon, but they deliver all over the U.S.. You can order Arrowroot powder and Tapioca and just about anything your heart desires.. Azure Standard.com , to browse their catalog. I really would like to try these, but I do not want to waste my ingredients if this recipe is a flop. I am not an amateur when it comes to baking, but for some reason there seems to be an ingredient missing in this recipe. Coconut flour is like a sponge and 1/4c of coconut oil is not enuf moisture to keep the cookies together. Please advise! When the coconut oil is melted first as the recipe directs, these do hold together. It’s important to let them cool completely. No egg or gelatin egg? No leavening? How in the world did you get them to stick together and rise like it shows in your picture?? wish I read some of the comments before I made these. I kept adding melted coconut oil to the mix. I like the idea of melting it in a pan, then adding the ingredients to the hot pan to keep the oil in liquid form. Taste is good, just needs something to not make it so crumbly. Hope another corrected recipe can come out. im laughing so hard right now! First time making something without reading reviews first. They are exactly as everyone says. Dried up little balls of coconutty powder! Well… Like the last post, I wish I would have read before making as mine are in the oven as we speak. However, the consistency was like cookie dough when mixing so I don’t have the same experience as everyone else with dry mix… Will let them cool completely… Off to take them out the oven! 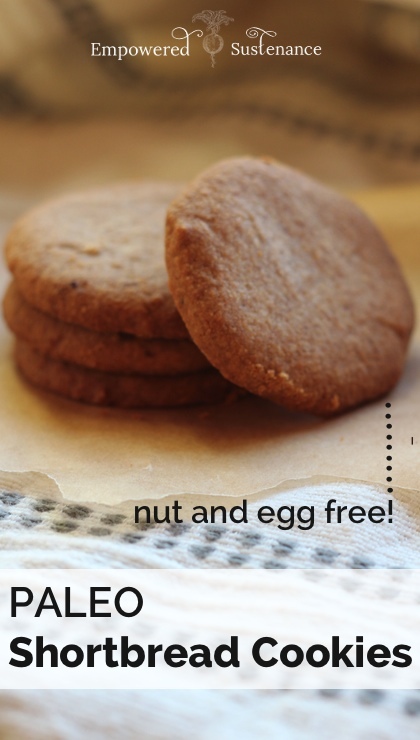 I fixed my shortbread cookies as best as I could by adding an egg and approximately 4-6 tablespoons of almond milk. That gave the dough enough moisture to slightly stick together and form balls. I also added some cinnamon, and the flavor of the cookie ended up being very subtle and rich. Good comment. I might try this. I found these cookies very good. I had one out of the oven, and it was super delicate, so I put them in the freezer and they were really yummy that way. I melted the coconut oil. When they went on the baking sheet they were 6 wet blobs that spread out a bit on their own. I will double the recipe next time and maybe add a little cinnamon. Thanks so much, Lauren! Enjoy Bastyr! It is my alma mater! Hi Lauren, would these be alright to eat if one has SIBO? I’m really craving some form of carbs, even if coconut flour is low-carb, and this recipe looks delicious. I wanted to get your opinion, thanks! I made these yesterday and followed the recipe to a T. They are absolutely delish!!! I didn’t have any problems with them at all. They are really tastey from the freezer. Thank you!! !